Benjamin Franklin Zellner (circa 1914, public domain). A native of Allentown, Lehigh County, Pennsylvania Benjamin Franklin Zellner was born on 26 March 1849 to a family beset by poverty and worry. As a result, at the tender age of five, his tiny feet were set upon a path that would ensure he would grow up more quickly than any child ever should. That journey began on 17 January 1855 when Lehigh County Directors of the Poor Solomon Kline, Peter Romig and Henry J. Schantz ordered that he be sent away to another county, and indentured there as a child laborer. Two months later, as his sixth birthday came and went, he toiled away on the farm of Michael W. Kistler in Stony Run, Albany Township, Berks County. Fortunately, he had been allowed by Kistler to at least obtain some degree of education. According to the federal census of June 1860, “Benjn/.. Zoellner” had attended school within the past year. Kistler, meanwhile, had begun building his own family with a wife and two elementary school-aged daughters, and had also amassed real estate and personal property valued at $3,600. Two years later, Ben Zellner ran away, believing that life as a soldier during the American Civil War would be better than a life of servitude. By the time he reached “sweet sixteen,” he had been wounded four times in combat and had endured captivity as a POW at two different prison camps – including at one that would become one of the most reviled sites in all of American history. His story is a shining example of service above self, and illustrates the human capacity to persevere in the face of adversity. Benjamin Zellner’s Civil War service, 167th Pennsylvania Drafted Militia (muster roll entry, Company G, 1862, public domain). On 22 October 1862 (alternate date 9 July 1862), at the tender age of 13 years, 3 months and 13 days, Ben Zellner became an American soldier. He was too young to do so, but he was articulate enough to persuade recruiters in Berks County, Pennsylvania that he was eligible. After convincing them that he was 17 years old, he then officially mustered in at Reading in Berks County on 12 November 1862 as a Private with Company G of the 167th Pennsylvania Drafted Militia (PDM). There were 400 tents neatly pitched on the side of the hill. They were arranged in rows of 20 each. Each company had 16 tents with 6 men in each tent. The tents for the captains and lieutenants were a few yards above the others. Above the tents at the head of each “street” and arranged in line was the cooking department…. Captain William A. Schall, the commanding officer of Company C noted, “The rations consist of fresh bread and beef 3 times a day. But today we got some crackers. We have sweetened coffee at every meal.” A spring for water was located nearby. Below the line of tents was a level plain used as a parade ground for drill which was held daily from 9 to 10 a.m. The men also learned to build fortifications…. About 1400 to 1500 men inhabited the camp. From these men a full regiment of 1,010 men was formed…. Muskets and cartridge boxes arrived on 4 December. Clothing had arrived shortly before. The regiment traveled to Harrisburg on the Lebanon Valley Railroad, arriving there about 1 a.m. They left Harrisburg in the same railroad cars and arrived in Baltimore about 10 a.m. Here they were given dinner by the Union Refreshment Association. At 6 p.m., they boarded cars of the Washington Branch Railroad…. The 39 mile trip took 7 hours. The newspaper reports, ‘The Regiment arrived in Washington about 1 A.M., and no lodging being provided for the men, they enjoyed the privilege of spending the balance of a cold night under the blue blanket of Heaven, without a sufficiency of boards or aught to lie upon; the accommodating Rail Road officers throwing them out of the poor shelter of the cars immediately upon arrival.’ By 10 a.m., they were housed in the barracks just vacated by the 12th New Jersey Regiment. On 29 January, at 11 p.m. the regiment was ordered to prepare for a march at midnight. They were to take 44 rounds of ammunition and 2 days rations. The pickets were recalled and at midnight they moved out under the command of Brigadier General Corcoran, General Peck’s second in command, along with the 11th Pennsylvania Cavalry, a field battery of 15 pieces, the 130th New York, the 13th Indiana, a part of the 6th Massachusetts, the 69th New York, and the 155th New York. They proceeded west on the Blackwater Road (also known as Poor House Road) toward Carrsville…. At some places the road was covered by knee deep water which the troops needed to wade through. After about 7 miles, they encountered the Confederate pickets. The cavalry skirmished with the pickets for an additional 3 miles where they encountered the main body of Confederates near a place called Deserted Farm or Deserted House…. The Confederates opened fire with the 14 cannon. The Union battery got into position. The two batteries were now facing each other 600 to 700 yards apart across a field that was empty except for a few apple trees. Behind each battery was a pine forest. 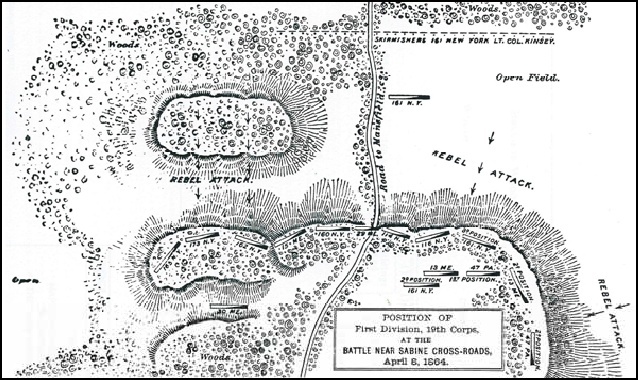 The road through the forest on the Union side was straight for about 1 1/2 miles and the Union forces continued to move along the road, filing right and left at the edge of the woods to positions behind the artillery…. The 130th, 13th and 6th were almost in position when the Union cannon began to fire…. When the front of the 167th Regiment was about 50 to 100 yards from the battery, a halt was ordered and the regiment was commanded to lie down along the side of the road. This order came just in time, for the Confederates had concentrated their fire on that location…. Colonel Knoderer continued to ride up and down the line, encouraging his men. When he was in the front and to the left of the regiment, his horse was hit by a shell and killed. The explosion tore away the colonel’s left hip, severed an artery, and left him with a deep wound in his side. Lieutenant-Colonel Davis’ horse was also killed beneath him…. Major Worth rode forth amid the severe fire and ordered the regiment forward. No sooner had the men risen than General Corcoran decided against an advance and ordered them to lie down again…. Some cavalrymen passed back and 2 companies of the 6th Massachusetts who could no longer remain in their position moved to the rear. Some of the men of the 167th mistook this as a sign of defeat and began to retreat. Both the New York Tribune and the Daily Times reported this action as an act of cowardice…. The commanding generals, however, did not share this opinion and absolved the regiment from blame as can be seen in the 4 February 1863 official report of Major General John J. Peck, based largely on Brigadier General Corcoran’s report. ‘General Corcoran ordered the infantry to advance at 5:15 a.m., but the order was not promptly executed, although given more than once. He says the One hundred and sixty seventh Pennsylvania became a confused mass, mixed up with other regiments, and filled up the entire road, leaving it impassable and creating a temporary confusion among some other regiments in the rear. At the request of the lieutenant colonel Joseph DePuy Davis it was sent to the rear to restore confidence and reform. On 11 April, at 5 p.m., a long drum roll mustered the 167th and in less than 10 minutes they were marching double time to the western front. Four companies under Major Jonathan See went to Fort Rozencrans and the redan (a V shaped work projecting from a fortified line) nearby. The other 6 occupied the rifle pits for a short time, then they were ordered to Drawbridge Battery (or Fort Peck as it was sometimes called). After nightfall, companies D, F, H, and I were ordered to a place between Drawbridge Battery and Fort Rozencrans [sic] where they labored 3 days and nights to build fortifications and tear down old houses that might obstruct their line of fire. Companies E, G, and K remained at Fort Rozencrans [sic] and were fired upon by Confederate sharpshooters…. For many days the bombardment of Suffolk was almost continuous, but the fortifications and defenders held. The siege finally ended on 30 April 1863 when General Robert E. Lee ordered Longstreet to move his troops elsewhere. From there, Private Ben Zellner and the 167th Pennsylvania were ordered to assist, from 12-26 May, with operations designed to disable the Seaboard & Roanoke Railroad, and were then stationed near the Holland House in Carrsville, Virginia from 15-16 May. Next attached to the 1st Brigade, 1st Division, 1st Army Corps, U.S. Army of the Potomac until August 1863, he and his fellow 167th Pennsylvanians participated in Dix’s Peninsula Campaign from 27 June to 7 July. While engaged in an expedition from White House to Bottom’s Bridge Virginia from 1-7 July, they next encountered Confederate troops at Baltimore Cross Roads on 2 July. Moved back to Washington, D.C. on 8 July, he and his fellow 167th Pennsylvanians were then moved to Maryland where, on 15 July, they joined the U.S. 1st Army Corps, which was part of the massive U.S. Army of the Potomac. From 15-24 July, they chased Lee’s troops retreating from the Battle of Gettysburg, Pennsylvania beyond the Rappahannock. Having completed their initial nine-month term of service later that Summer, the 167th Pennsylvanians were ordered back home to Berks County, Pennsylvania where, on 12 August 1863, Private Ben Zellner honorably mustered out. A teenager who was undaunted by all that he had seen during his service with the 167th Pennsylvania Drafted Militia, Benjamin F. Zellner turned right around and re-enrolled for a three-year term of service. Still too young to officially he enlist, he chose, once again, to lie about his age. On 15 December 1863, with prior military service experience under his belt, he was able to convince recruiters in his hometown of Allentown that he was 19 years old – rather than 14. He then officially re-mustered on Christmas Day at Norristown, Montgomery County. Military records at the time of his enlistment described him as being a farmer from Lehigh County who was 5’7” tall with light hair, blue eyes and a light complexion. As the New Year began, Private Ben Zellner was settling back into military life at a new duty station which was geographically and culturally far from all he knew – Fort Taylor in Key West, Florida. While there, he and his new comrades in the 47th Pennsylvania Volunteer infantry were assigned to garrison and provost duty – charged with preventing an important federal installation from falling into enemy hands while also protecting Union supporters. He soon realized that he had joined a battle-hardened regiment – one whose members had been sorely plagued by disease after having also been battered severely in combat. 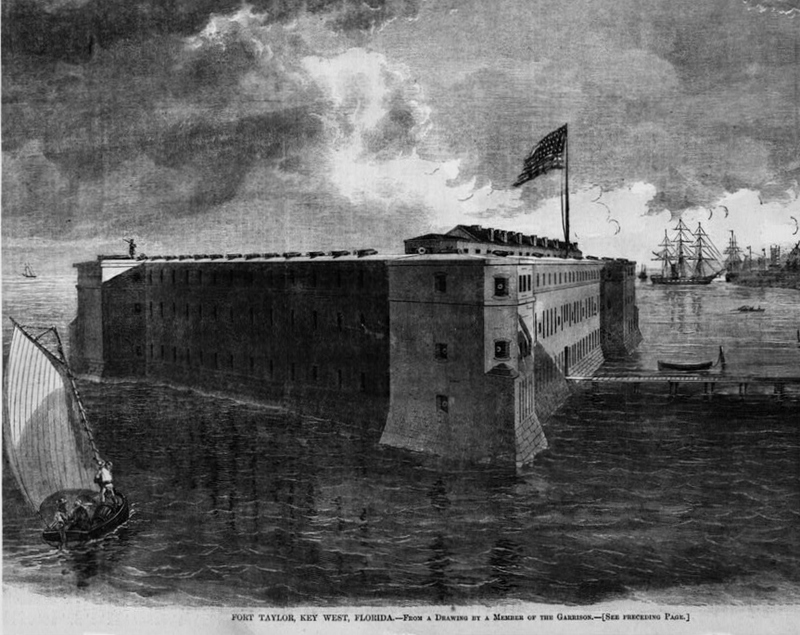 The regiment had also been divided within the past year – with a detachment of men from Company A sent north to Fort Myers and men from Companies D, F, H, and K sent south on detached duty to Fort Jefferson in Florida’s remote Dry Tortugas. On 25 February 1864, Private Ben Zellner and his fellow regiment members set off for a phase of service in which they would truly make history. Steaming first for New Orleans via the Charles Thomas, the 47th Pennsylvanians arrived at Algiers, Louisiana on 28 February, and were then shipped by train to Brashear City. Following another steamer ride – to Franklin via the Bayou Teche – the 47th joined the 2nd Brigade, 1st Division of the Department of the Gulf’s 19th Army Corps. In short order, the 47th would become the only Pennsylvania regiment to serve in the Red River Campaign of Union General Nathaniel Banks. Often short on food and water, the regiment encamped briefly at Pleasant Hill the night of 7 April before continuing on the next day, marching until mid-afternoon. 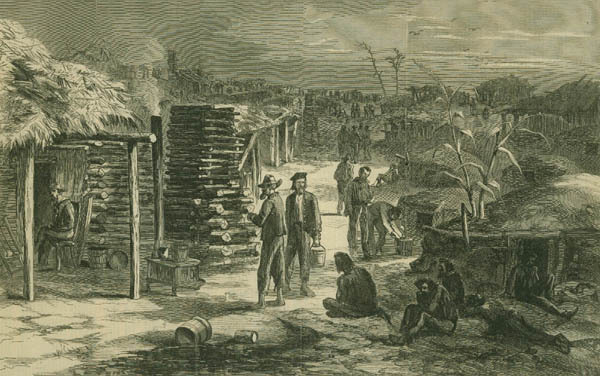 Life at Camp Ford, the largest Confederate Army prison camp west of the Mississippi (Harper’s Weekly, 4 March 1865, public domain). Benjamin Zellner, who was one of the youngest soldiers during the Civil War, was captured by the Confederates at Pleasant Hill, La., April 8, 1864. He was a member of Co. K, 47th Regiment, with Gen. Banks’ army on the Red River expedition. Comrade Zellner was wounded in a charge to the left of the lines and fell on the field. The Union forces being driven back, he, with a number of others was captured. After being kept at Pleasant Hill two weeks, they were removed to Mansfield, La., on a Saturday night and kept over night [sic] in the Court House until Sunday morning. Thence they were removed to Shreveport, La., and again kept in the Court House. From thence they were marched 110 miles to Unionville prison at Tyler, Tex…. The 47th was the only Penn’a Regiment to participate in the Red River campaign. In about a month [after arriving at Camp Ford in Texas, following their 8 April capture in Louisiana] 300 or 400 of the strongest were brought back to Shreveport and then transported down the Red River to an old station and marched four days, when they were taken by train to Andersonville…. 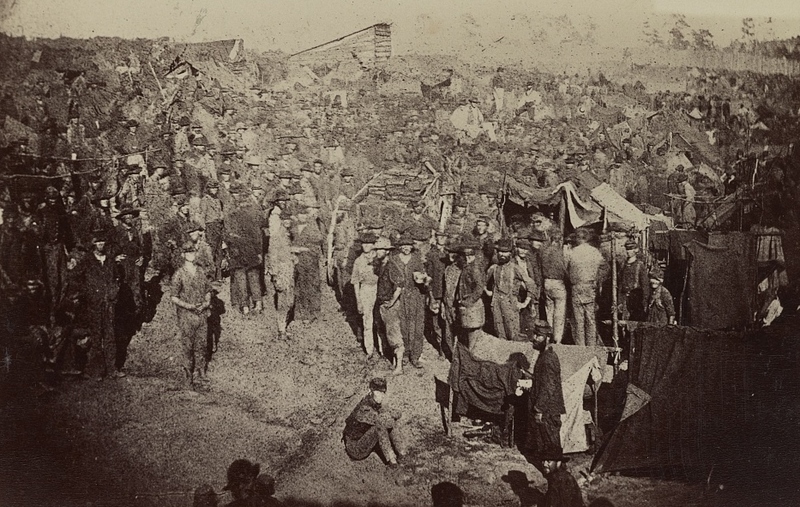 Issuing Rations at the Andersonville POW Camp, 17 August 1864 (view from main gate, U.S. Library of Congress, public domain). Those Union prisoners recently released from Camp Sumter, at Andersonville, Ga., have made affidavit of the condition of the 35,000 prisoners confined there. The horrors of their imprisonment, plainly and unaffectedly narrated, have no parallel outside of Taeping or Malay annals. Twenty-five acres of human beings – so closely packed that locomotion is made obsolete, compelled to drink from sewers, and to eat raw meat like cannibals – are dwelling under vigilant espionage, hopeless, helpless, and Godless. Some are lunatic, and others have become desperately wicked; all are living, loathing, naked, starved fellow-men. Reportedly held as a POW for 6 months and 14 days, according to the 26 March 1915 edition of The Allentown Leader, Zellner was freed from captivity during a Union and Confederate army prisoner exchange in September 1864 (per a report in the 12 April 1911 edition of the Reading Eagle). 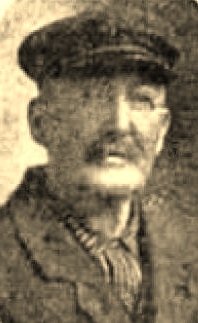 The 8 April 1911 Allentown Leader added that, after this prisoner exchange, which took place “along the James River,” he was then sent with a number of his fellow former POWs “to Washington, to Fortress Monroe, to New York and home.” Following a period of recovery, he then returned to service with his regiment just in time to participate in a key portion of Union Major-General Phillip Sheridan’s 1864 Shenandoah Valley Campaign. By the time that Private Ben Zellner was finally well enough to reconnect with his Company K comrades, the 47th Pennsylvania Volunteers had already completed the opening weeks of Sheridan’s Fall 1864 Shenandoah Valley Campaign. In fairly short order after his arrival in Virginia, he fought with them in the Battle of Cedar Creek. Once again, casualties for the 47th were high, including multiple members of Company K who were killed or mortally wounded in action. Private Ben Zellner, twice wounded during the Battle of Pleasant Hill, Louisiana and subsequently held as a POW at two different Confederate prison camps, was wounded again – twice – by bayonet and via a gunshot wound to his right thigh. But once again, he survived, recovered from his wounds, and returned to service with his regiment. Stationed at Camp Fairview in Charlestown, Virginia (in what is now West Virginia), the 47th Pennsylvania Volunteers were assigned to outpost and railroad guard duties. In February, they were then attached to the Provisional Division of the 2nd Brigade of the Army of the Shenandoah and ordered to move, via Winchester and Kernstown, back to Washington, D.C.
On 19 April 1864, the 47th Pennsylvania Volunteers were responsible for helping to defend the nation’s capital following the assassination of President Abraham Lincoln. Encamped near Fort Stevens, they received new uniforms and were resupplied. Letters home and later newspaper interviews with survivors of the regiment indicate that at least one 47th Pennsylvanian was given the high honor of guarding President Lincoln’s funeral train while others may have guarded the key Lincoln assassination conspirators during the earliest days of their imprisonment and trial. On their final southern tour, the men of Company K and their fellow 47th Pennsylvanians served in Savannah, Georgia from 31 May to 4 June. Again in Dwight’s Division, this time they were with the 3rd Brigade, U.S. Department of the South. Taking over for the 165th New York Volunteers in July, the 47th Pennsylvania Volunteers took up their new quarters in Charleston, South Carolina at the former mansion of the Confederate Secretary of the Treasury. Duties during this phase of service were frequently Provost (military police) or Reconstruction-related (repairing railroads and other key regional infrastructure items which had been destroyed or damaged during the long war). Finally, beginning on Christmas day of that year, the majority of the men from Company K, 47th Regiment, Pennsylvania Infantry – including Private Ben Zellner – began to honorably muster out at Charleston, South Carolina, a process which continued through early January. Following a stormy voyage home, the weary, soon-to-be-civilians disembarked in New York City, and were then transported to Philadelphia by train where, at Camp Cadwalader on 9 January 1866, as members of the now 47th Pennsylvania Veteran Volunteers, they were officially given their discharge papers. Benjamin Zellner’s pension payment card documented his Civil War battle wounds (U.S. Veterans Administration, public domain; double click to enlarge). At Cedar Creek he got a rebel bullet in his leg. It worked its way down and he still carries it in his heel. It gives him much pain. After that they were sent to Charleston, South Carolina. There he was caught under a five story wall at a fire, only three escaping alive. Lewis and Daniel Long, of Longswamp, carried him out unconscious to the Charleston Hotel, where the first rebel flag waved in 1861. In that fire, while on police duty as a soldier, he lost the sight of his left eye and the hearing of his left ear; his jaw bone was broken and he sustained 11 scalp wounds. Newspaper accounts published about his service later in life indicated that the bayonet wound that he suffered at Cedar Creek was so severe that it never healed properly. Allentown, Pennsylvania (circa 1865, public domain). Following his honorable discharge from the military, Ben Zellner returned home to Pennsylvania’s Lehigh Valley, and began a new journey – that of family man. Sometime around 1872, he wed fellow Allentown native Amanda Amelia Shuman (1851-1943). Two years later, they welcomed the arrival of their only child, Arthur Franklin Zellner (1874-1940), at their Allentown home on 1 May 1874. By 1880, Ben Zellner and his wife Amanda were residing with their six-year-old son Arthur at what would become the couple’s residence for the duration of their long marriage – 610 Gordon Street in Allentown. He supported his wife and son that year as a worker in a woolen mill. Ben Zellner, one of the best known veterans of the civil war in this city, is spending days and nights of misery from a bullet wound received at the battle of Cedar Creek, Oct. 19, 1864. Comrade Zellner was a member of the 47th Regiment which was with Sheridan’s forces in the Shenandoah Valley. In the thick of the fight he got a bullet in the right thigh. He tells the story of how he helped to carry some of the wounded after that and only realized that he was hit after the bloody day was done. The bullet worked downward. In 1868 it passed the knee joint. Then it sank through the calf until it finally reached the ankle joint where it now rests. Off and on it gave Mr. Zellner much pain years ago. Back in the eighties he called on Dr. Estes at St. Luke’s Hospital to have the bullet cut out. Dr. Estes told him that cutting bullets out of the ankle joints was a serious matter and declined to undertake the job. Then Mr. Zellner called on Dr. D. Hayes Agnew, of Philadelphia. Dr. Agnew told him just what Dr. Estes had said. During the past two months the bullet has given him excruciating pain. It is worst at nights when it causes a pounding and racking in the system that throws him all around the bed. Unless he can get relief he will have to submit to an amputation of the foot. Today it is 47 years ago since Comrade Ben Zellner, who was one of the youngest soldiers in the Civil War, was taken prisoner at Pleasant Hill, La. He was a member of Co. K, 47th Regiment, with Gen. Banks’ army on the Red River expedition. Comrade Zellner was wounded in a charge to the left of the lines and fell on the field. The Union forces being driven back, he, with a number of others, was captured. Among the gallant band of Civil War veterans who participated today in the reunion of survivors of the 47th Regiment, Pennsylvania Volunteers, at Lebanon, as the guests of Mrs. Gobin, widow of their old commander, General J. P. S. Gobin, none had a more distinguished career than Comrade Ben Zellner, of Allentown. Comrade Zellner lays claim to having been the youngest soldier to shoulder a musket in the entire Civil War on the day of his enlistment. He was barely 13 years old when he went to the field and while it is stated there were younger soldiers in the Union army they were musicians not armed with a gun as was the case with him. Through all the hard career of the 47th Pennsylvania as a fighting regiment Comrade Zellner was in the forefront, in South Carolina, in Florida, along the Red river in Louisiana, and in the Shenandoah Valley. Among his experiences was that of being taken prisoner and he suffered all the horrors of Andersonville prison. Like all the soldiers of the 47th Pennsylvania he saw Sheridan’s ride and was one of the army that was rallied by the General and charging back at Cedar Creek turned defeat into victory. Comrade Zellner has vivid cause to remember Sheridan’s ride for it was during that fight that he was twice wounded. One of these was a bayonet thrust that has never quite healed and the other is a bullet which he carries in his leg to this day. COMRADE ZELLNER’S SON CAUGHT IN FLOOD. Comrade Ben Zellner and wife received a letter from their son, Arthur F. Zellner, that he is safe and sound after a terrifying experience in the Ohio floods. Mr. Zellner has for years been a telegraph operator for the Pennsylvania Railroad at Columbus, where he has his home. On the Sunday before the flood he was sent to Dayton to relieve a sick man for a week. He was caught in the freshet and lost all his belongings. His boarding house near the river being swept away…. 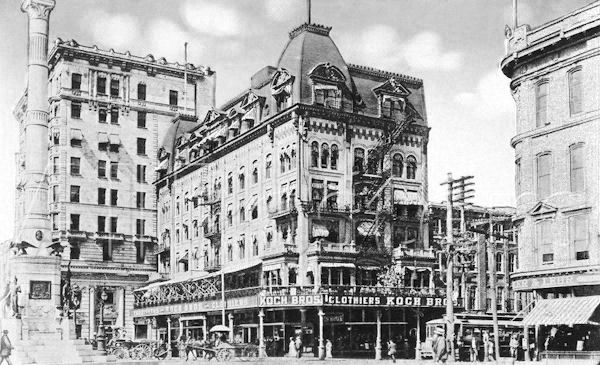 The Hotel Allen in Allentown, Lehigh County, Pennsylvania (circa 1912, public domain). Comrade Ben Zellner of 610 Gordon Street, one of the youngest veterans in the Civil War in all America, is today celebrating his 66th birthday anniversary. Born March 26, 1849, Comrade Zellner was only 13 years, 3 months and 13 days old when he enlisted in the 167th Pennsylvania Regiment on July 9, 1862. Although there were a few younger soldiers in the Civil War, it is claimed by friends of Comrade Zellner that he was the very youngest soldier to go out carrying a musket, the younger ones being drummer boys. Although born in Allentown, he enlisted from Albany Township, Berks County, where he was working on a farm. After short service with the 167th, he enlisted in the celebrated 47th Pennsylvania Volunteers, typically a Lehigh county regiment, that served all the way from Pocotaligo, S. Ca. 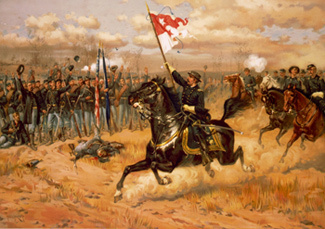 [sic], and Key West to the Red River expedition and the Shenandoah Valley, where they fought in the battle of Cedar Creek and saw “Sheridan’s Ride.” Comrade Zellner acknowledges that, like the [r]est, he was running from the Rebels until Sheridan came along, and turned his troops to fighting and victory. Comrade Zellner endured all the horrors of Andersonville Prison for 6 months and 14 days, until exchanged. He was wounded four times, twice at Pleasant Hill, La., and twice at Cedar Creek, and still carries a Cedar Creek bullet in his right ankle. Considering the hardships he endured and the shooting up he suffered, he is in fine condition physically. Sadly, that same year, he learned that his son and daughter-in-law, Arthur and Allovette Zellner, had lost their child. The infant was stillborn on 25 October 1915. Comrade Ben Zellner, of this city, who is declared to have been the youngest soldier in the Union army during the Civil War to carry a musket, signalized his 68th birthday anniversary today by offering himself as a volunteer at the Allentown recruiting station, to fight the Germans. The recruiting officer laughed, saying: ‘I greatly admire your pluck, but you are beyond the age when I can accept you.’ Comrade Zellner, who was always a red-blooded American, thinks the international situation portends war between the United States and Germany, and if this comes to pass, he told the recruiting officer to remember that he would be at the service of his country once more for any duty for which he might physically be fitted. He is still spry, but no longer has the stamina he possessed when he volunteered for the Civil War when his age was thirteen years, three months and thirteen days. But in offering his services to the recruiting officer he told the latter to make a note that he is fit for anything but marching, and that is due to the fact that he carries a bullet in his leg since the battle of Cedar Creek. Comrade Zellner was born in Allentown, March 26, 1849, but was working on a farm in Berks County when patriotism impelled him to enlist in the 167th Pennsylvania Volunteers in June, 1862…. From the Artillery he was discharged in September, 1863, and he came home and re-enlisted in the celebrated 47th Pennsylvania Volunteers, the glorious Lehigh County regiment that covered more ground than any other in the Rebellion. He joined it at Key West, just before it started with the ill-fated Red River Expedition under General Banks. At Pleasant Hill, La., in April 1864, he was captured, and with others was marched 165 miles to Unionville prison at Tyler, Texas. A month later they were marched 110 miles to Shreveport, whence a steamer took them down the Red River to an old landing. After some more marching to a lonely railroad station they were taken to that horror of horrors, the Andersonville prison. What the prisoners endured there at the hands of the brutal commander, Major Wirz, Comrade Zellner declares has never half been told. They were forced to drink water contaminated by their own sewage, which was knee deep, and those tempted to cross the dead line near a beautiful and clear stream were shot. This was done by order of Major Wirz to torture the prisoners. Comrade Zellner thinks that from what he has read some of the prisoners of the Germans are being treated just as bad now, and that is what prompted him to volunteer at this time. Wirz was later hanged, and it is a peculiar coincidence that one of the guards at the execution was a close friend and neighbor of Comrade Zellner, U. S. Litzenberg, another noble Allentown veteran. Every day there were a hundred deaths and upwards at Andersonville prison, until the churchyard of the place was overcrowded with twenty thousand graves. Those that survived were underfed and got scrofula, and to this treatment Comrade Zellner ascribes the fact that his teeth are bad. And at that he fared better than many, because the teeth of some fell out. More of the prisoners would have died but for an act of God which Comrade Zellner himself witnessed the creation, of the Miracle Spring within the prison encampment. On Aug. 21, 1864, there was a rain the like of which none was never seen, and they all thought the world was coming to an end. Immediately after the downfall the Miracle Spring gushed forth, clear, healthy water, and that spring is there to this day, carefully walled in. He eventually got relief by being exchanged, and after recuperating at home rejoined the 47th in the Shenandoah Valley, where it was part of the Command of General Sheridan. Comrade Zellner was one of those who saw and was rallied by ‘Sheridan’s Ride’ at Cedar Creek, and it was in the hand-to-hand fighting that followed the rally that he got that bullet in his right leg, and a bayonet wound in the left. He says the soldiers were so exalted by the inspiration of Sheridan he among them, that they never minded their wounds, and never stopped until the battle was won. The bullet, settled in his ankle, and it was decided by the surgeons that it would be less dangerous to leave it there than to cut it out. After Lee’s surrender the regiment was in the Grand Review at Washington, and was then sent to Savannah and then to Charleston, where during a fire a five-story building caved on sixteen soldiers, only two of whom survived, one of them Comrade Zellner. On 1 May 1920, his U.S. Civil War Pension rate was increased to $50 per month. For nearly two decades, he had his wife then continued to reside at their Allentown home at 610 Gordon Street. What Happened to His Wife and Son? Sometime in 1940, Amanda Amelia (Shuman) Zellner relocated to Ohio to be closer to her son, Arthur F. Zellner, who resided at 201 Eldon Avenue in Columbus, Franklin County. This relocation evidently happened sometime after April 1940 since she was not documented as a member of Arthur Zellner’s household when the federal census taker arrived. Sadly, her time with her son was short. Following his passing in 1940, his remains were returned to Pennsylvania, and he was laid to rest in the same cemetery – Greenwood – where his father had been buried in 1938. Amanda Zellner then continued to reside at her son’s home until her son’s widow Allovette Zellner determined that she needed more advanced care. Transferred to the St. Clair Rest Home at 338 St. Clair Avenue in Columbus on 2 March 1943, Amanda Zellner was plagued by advanced senility and arteriosclerosis; she then suffered heart failure just over five months later, and died at that nursing home at the age of 91 on 16 August 1943. After her remains were returned to Allentown for reburial, she was laid to rest next to her husband at Allentown’s Greenwood Cemetery. 1. 47 Years Today Since Rebels Caught Him: This a Memorable Anniversary for Comrade Ben Zellner. Allentown, Pennsylvania: The Allentown Leader, 8 April 1911. 2. 167th Regiment, Pennsylvania Infantry (Drafted Militia), in Union Pennsylvania Volunteers, in Battle Unit Details, in The Civil War. Washington, D.C.: U.S. National Park Service, accessed 14 May 2018. 3. A Rebel’s Horrid Bullet: It Ended Its Flight Long Ago But Its Sting Is Still Felt. Allentown, Pennsylvania: The Allentown Leader, 18 November 1895. 4. Allentown’s Youngest Civil War Veteran. Reading, Pennsylvania: Reading Eagle, 12 April 1911. 5. Amanda Amelia Zellner. Death Certificates. Columbus, Ohio: Ohio Department of Health, 16 August 1943. 6. Arthur F. Zellner, Allovette Layman, Benjamin Zellner, Amanda Shuman, Henry Layman and Abbie Jenkins. Marriage Records. Columbus, Ohio: Franklin County Probate Court, 17 November 1912. 7. Arthur F. Zellner. U.S. World War I Draft Registration Cards. Washington, D.C.: U.S. National Archives and Records Administration, 1917-1918. 8. Bates, Samuel P. History of Pennsylvania Volunteers, 1861-5. 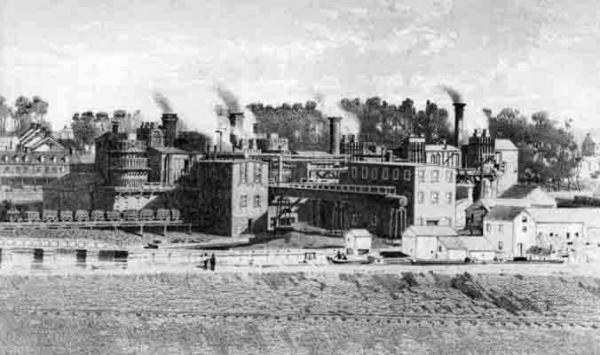 Harrisburg, Pennsylvania: B. Singerly, State Printer, 1869. 9. Ben Zellner, in “Allentown” (report on the 47th Pennsylvania Volunteers’ annual reunion). Allentown, Pennsylvania: The Reading Times, 24 October 1927. 10. Benjamin F. Zellner, in Indentured. Allentown, Pennsylvania: Lehigh Register, 24 January 1855. 11. Camp Sumter, in Editorial Jottings. 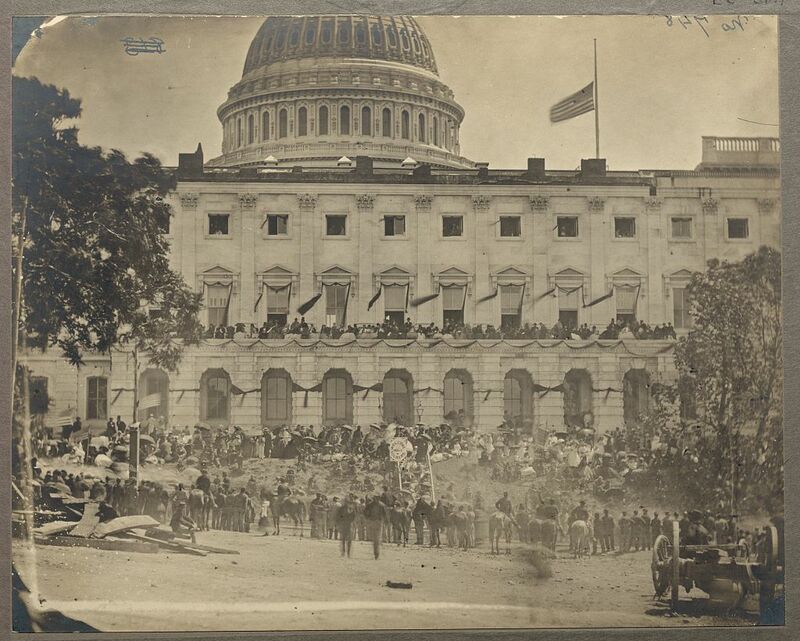 Washington, D.C.: The Soldiers’ Journal, 21 September 1864. 12. Cellner [sic], Benjamin, in Camp Ford Prison Records. Smith County Historical Society. Tyler, Texas: 1864. 13. Comrade Zellner 66 Years Old Today: Youngest Civil War Veteran to Shoulder a Musket. Allentown, Pennsylvania: The Allentown Leader, 26 March 1915. 14. Comrade Zellner’s Birthday. Allentown, Pennsylvania: The Allentown Leader, 27 March 1896. 15. Comrade Zellner’s Son Caught in Flood. Allentown, Pennsylvania: The Allentown Democrat, 2 April 1913. 16. Gilbert, Randal B. A New Look at Camp Ford, Tyler Texas: The Largest Confederate Prison Camp West of the Mississippi River, 3rd Edition. Tyler, Texas: The Smith County Historical Society, 2010. 17. His Glorious Record as a Soldier: Fought at Gettysburg, Red River and Shenandoah Valley and Besides Enduring the Horrors of Andersonville, Carries Bullet to This Day. Allentown, Pennsylvania: The Allentown Leader, 26 March 1917. 18. Infant Zellner, Arthur F. Zellner, and Allovette Layman. Death Certificates. Columbus, Ohio: Ohio Department of Health, 25 October 1915. 19. Reunion of Veterans. Reading, Pennsylvania: Reading Eagle, 21 October 1911. 20. Schmidt, Lewis. A Civil War History of the 47th Regiment of Pennsylvania Veteran Volunteers. Allentown, Pennsylvania: Self-published, 1986. 21. Shugar, Gary. The 167th Pennsylvania: War’s Only All-Berks Regiment. Reading, Pennsylvania: Berks History Center, accessed 15 May 2018. 22. Thoms, Alston V., principal investigator and editor, and David O. Brown, Patricia A. Clabaugh, J. Philip Dering, et. al., contributing authors. Uncovering Camp Ford: Archaeological Interpretations of a Confederate Prisoner-of-War Camp in East Texas. College Station, Texas: Center for Ecological Archaeology, Department of Anthropology, Texas A & M University. 23. U.S. Census and U.S. Census of Union Veterans and Widows of the Civil War (1890). Washington, D.C., Pennsylvania and Ohio: 1860, 1880, 1890, 1900, 1910, 1930, 1920, 1930, 1940. 24. Zellner, Benjamin. Civil War Veterans’ Card File, 1861-1866 (Co. G, 16th Pennsylvania Drafted Militia and Co. K, 47th Pennsylvania Infantry). Harrisburg, Pennsylvania: Pennsylvania State Archives. 25. Zellner, Benjamin. Registers of Pennsylvania Volunteers, 1861-1865 (Record Group 19: 167th Pennsylvania Drafted Militia, Company G), in Records of the Department of Military and Veterans’ Affairs. Harrisburg, Pennsylvania: Pennsylvania Historical and Museum Commission. 26. Zellner, Benjamin. U.S. Veterans Administration Pension Payment Cards (certificate no. : 201.460). Washington, D.C.: U.S. National Archives and Records Administration, 1892-1938.